Congratulations to Gateway Properties of Upstate New York Inc., This Week’s Broker of the Week! Congratulations to Gateway Properties of Upstate New York Inc. with Gateway Properties of Upstate New York Inc. who sold 11,400 acres in Essex County, New York. This sale occurred on March 27, 2015 and was submitted through our Comparable Sales Program. Gateway Properties proudly offers for sale this extraordinary parcel, look inside to see some of the amazing features and details about this one of a kind piece of property that stretches into three townships in Essex County: Jay, Lewis and Chesterfield. The 11,400 acre property offers picturesque hardwood and conifer forests, open bogs, mountain views and amazing views of Lake Champlain and Burlington, Vermont. This property is in thirty contiguous parcels and is accompanied by a 480A timber management plan. Capital Timber Value is estimated to be over 6.8 million dollars, (approximately $596 per acre) representing approximately sixty percent of the asking price. Wollastonite, a naturally occurring mineral widely being used in many industrial applications and available in only a couple of known locations in New York State is also found on this property in abundance. There are multiple cabins and structures on this property. The main lodge was just completed in the last few years. The other structures and cabins vary from bunkhouses to cabins with bedrooms, bathrooms, and kitchenettes. The structures have been well maintained and taken care of. 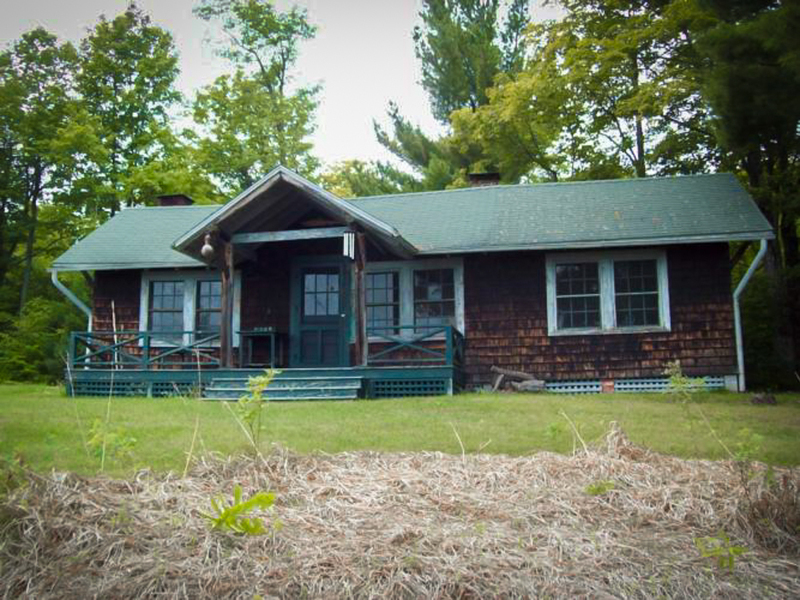 All structures were built and maintained to fit in with the Adirondack spirit of this property. Lawson Pond, Coonrod Pond, Ore Bed Pond, and multiple smaller ponds. Most of these ponds contain an abundance of fish. Hale Brook is a natural hatchery stream for Brook Trout. Swim, fish, or kayak to your hearts content. Hale Brook Forest is located close to I-87 in Essex County. The property lies in three townships; Jay, Lewis and Chesterfield. The closest village is Elizabethtown, NY. Property is also close to Keene Valley, Lake Placid and Burlington, VT. Airports are available in Burlington, VT and Plattsburgh, NY. The topography of this piece varies due to its size. It ranges from gentle valleys to steep slopes along Bluff and Little Bluff Mountains, Beech Ridge, Perkett Mountain, Spear Mountain, Oak Hill, Sunset Hill, Hale Hill, Sugar Hill, Kiln Mountain, Lasperance Mountain and Slash Hill. The areas along the steep slopes that cannot be managed for timber were labeled as inoperable in the original management plan. The main access to this property is Hale Hill Lane, a gravel town road. This road becomes a private road at the gate just past the old sawmill. The main access road is a well maintained gravel road to the camps located to the east of Hale Hill. From the main access road, many miles of woods roads access the remainder of the property. Due to the steep hill just past the gate, harvesting is limited to summer and fall months. The roads are maintained by the landowner or a contractor. Additional roads have been added since 1998 and several loops in the road system have been created. The overall infrastructure through the property has been meticulously kept up. Boundary lines have been maintained over the years. Most lines have been painted and blazed since the ice storm of 1998. These lines have continued to be repainted on a regularly scheduled basis by the seller. Most boundaries are painted yellow. A few, however, have been painted red by adjoining landowners. Because this property lies wholly in the Adirondack Park, it falls under Adirondack Park Agency guidelines, as well as local town enforcements on building codes. Soils range from well drained to poorly draining There are areas of loamy sands and lowline glacial outwash as well as woodsy organic material on outwashed plains, common Adirondack soils found in this area of the Adirondacks. Wollastonite is a naturally occurring mineral with many unique characteristics. Through advanced processing, it has become one of the most versatile functional fillers in the marketplace. Wollastonite increases the performance of many products including plastics, paints and coatings, construction materials, friction, ceramic and metallurgical applications to name a few.1 Deposits of Wollastonite in the United States have only been found in a few of the Southwestern states and a couple of locations in New York State. Under the present ownership, deer, bear, and moose populations have been sustained and perhaps increased. Other wildlife, including weasel, beaver, coyote, bobcat, coy dog, and eagle, have been seen. Grouse, turkey and woodcock are surviving the inclement weather and predators and songbirds are flourishing. There are currently no known endangered species on this property. The timber value of this property is estimated to be over 6.8 million dollars at this time. The estimated timber numbers and projected values, based on two sets of pricing, (low end of 6.8 million and high end of 11.4 million). Note: The seller and or his agent do not make any guarantee to the volumes, values, or quality of the timber in Hale Brook Forest. The prospective buyers should by their due diligence, make their own assumption on the volumes, values and quality. Some of the timber species available on this property are Hard Maple, Red Oak, White Ash, Yellow Birch, Soft Maple, White Birch, Black Cherry, Basswood, Beech, White Pine, Red Pine, Scotch Pine, Red Spruce, White Spruce, Balsam Fir, Hemlock, Aspen, Elm, Black Ash, and Balsam Poplar. It is Gateway Properties endeavor to find a buyer who will find this property as beautiful as the sellers have found it, not just for the investment but for all of the wonderful features that the property has to offer. Even aged management has been the primary management system used on the Lewis tract. Uneven aged management has been used on the stands along Trout Pond Road to keep the area along the road in continuous forest cover. The harvesting of the property is limited to summer months due to the steeper slopes of the main access road. Approximately 200 acres have been scheduled for harvest each year. The harvests have been broken down by compartments or parts of compartments. This property has been used for recreational activities by the landowners. Recreational activities on the Hale Brook Forest include but are not limited to hunting, fishing, trapping, hiking, snow sledding, cross country skiing, birding, etc.